If you are looking at how to become an electrician, looking to retrain and change your career or simply just want to add electrics to your existing trade skill set, it’s important that you get the best training and electrician qualifications. There are a variety of training routes available for you to become a qualified electrician. The traditional route involves an NVQ electrical apprenticeship, however, with low apprenticeship salaries of £3.50 /ph and guided learning time requirements, they sometimes aren’t suitable for everyone. If you are an adult learner who is looking to retrain and change career, then there is an intensive route available, which takes into account time and money constraints that you may be facing. 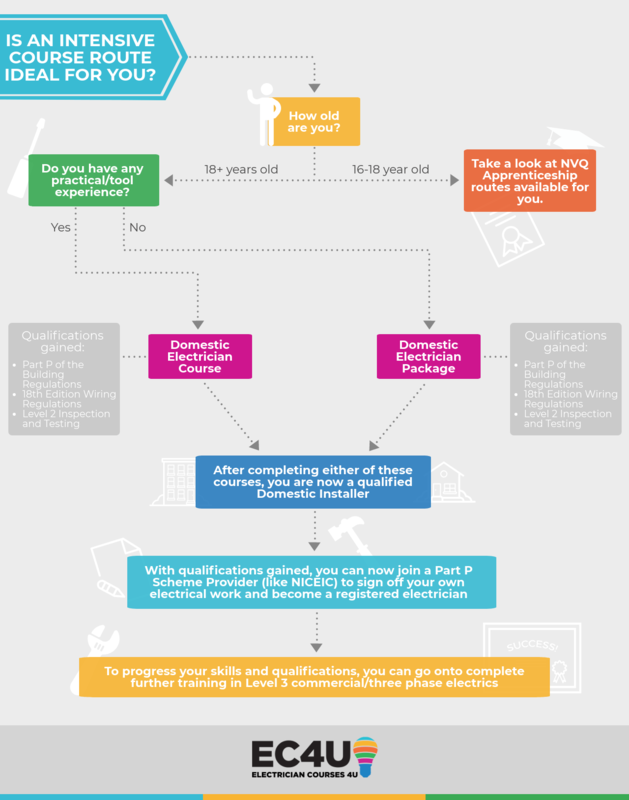 For apprenticeships, there are 3 routes available and they are aimed at those who are 16-19 years old, all taking into account whether you have secured an apprenticeship with an electrical business or not. 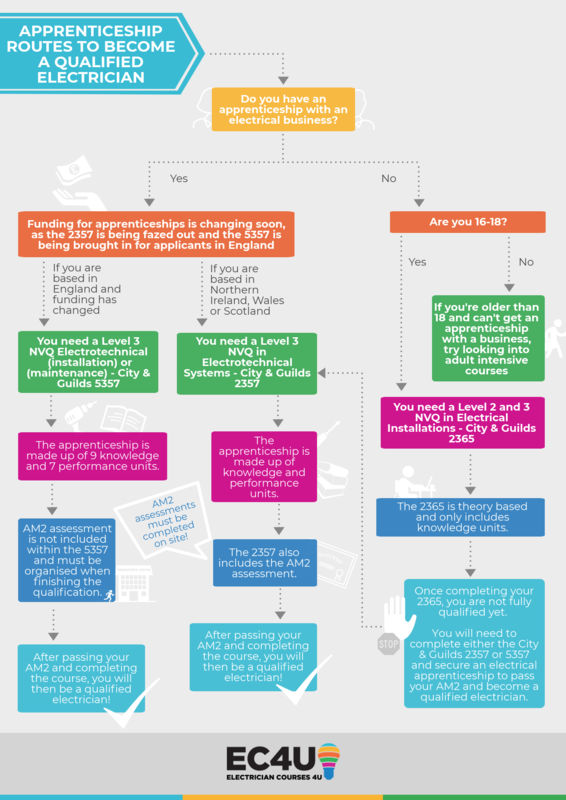 To become a fully qualified electrician with an apprenticeship, you must complete a final AM2 assessment. For the intensive option, you must be 18 years or older, and by the end of your training you will become a qualified Domestic Installer. You will then be able to progress your qualifications further with commercial Level 3 qualifications in the future, to become a fully qualified electrician. Whichever training route you choose, it’s important to remember that if you want to sign off your electrical work to ensure it meets current Building and Wiring Regulations, you must join a Part P Scheme Provider. This applies to whether you have completed an apprenticeship or an intensive route, and it is possible to join a scheme after completing either. This is predominately aimed at 16-18 year olds and usually is delivered by colleges and fully funded by the government. Since August 2013 it has become mandatory to stay in full time education until the age of 18, which is where this City and Guilds 2365 fits the bill. Within the course you will have to take the Level 2 Diploma in Electrical Installations in their first year and if successful move on to the Level 3 Diploma in Electrical Installations in the second year. At the end of the 2 years you will undoubtedly have experience and knowledge but will be required to get a job as an apprentice if you wish to complete your NVQ qualification. Essentially the NVQ part is 12 months of onsite assessments, a couple of units not covered in the 2365 course and your AM2 (Final Exams). To do this you will have to move over to the City and Guilds 2357 qualification and complete the additional units in order to become a fully qualified electrician. A word of warning to anyone considering this course if you do not have a job you cannot complete the 2357 course and become fully qualified. This Level 3 NVQ Electrotechnical Apprenticeship is aimed at anyone 16+ and is delivered by both Colleges and privately owned training companies. Within the college environment the apprenticeship course is usually part time and can take 3 years to complete, whereas it can be done far quicker via the private companies as it is a full time course. There is funding available for this course via the Government depending on age and figures can be obtained from the Skills funding agency. However, funding in England is due to change soon and will impact the structure of this qualification, as the new Level 3 NVQ Electrotechnical Qualification City & Guilds 5357 will take place of the 2357. There is only a Level 3 in this 2357 course which is split up into knowledge/workshop units and takes place at either the college or training centre and the NVQ performance units which are essentially onsite assessments. Another word of warning, as with the City and Guilds 2365, if you are not in employment you will not be able to progress any further. You must be in employment in order to qualify for the 2357. Assuming positively you are in employment and you pass the performance units of the course, you will then have your AM2 or final exams to complete and if successful you will be fully qualified. This Level 3 NVQ Electrotechnical course will take the place of the 2357 when funding for apprenticeships change in England soon. The 2357 will no longer be completed in colleges or private training companies in England, however, it will still be available to complete in Scotland, Northern Ireland and Wales. This course is a fast track solution to the 2357 and offers the candidate a streamlined process, so that they can become a qualified electrician at the end. Within the course, you will have to complete 9 knowledge modules and 7 performance elements. Like the 2357, you must be employed as an apprentice with an electrical business in order to qualify for this course. Unlike the 2357, the AM2 assessments are not included within the course. After you finish your 5357 course, you must then organise your AM2 assessment and successfully pass them in order to become a qualified electrician. This is essentially this is the same course, qualification and same outcomes if successful as the City and Guilds 2357, just a different provider, EAL, who are equally well recognised within the industry. You must be 16+ to take this course and you do not have to be employed as an apprentice to complete. However you will need to complete your AM2 assessment on site. The AM2 assessment is not included within this course and you will need to find a centre to complete this final assessment at. Our Domestic Installer Course is aimed at anyone who is 18+ and cannot afford either the time or cost associated with all of the other training routes mentioned above. If you already have tool skills or are an associate tradesperson, then we would suggest our Domestic Electrician Course, which is split up into 4 individual courses (Keystage course, Level 2 Inspection and Testing course, Part P course and 17th Edition course) which will give you the key knowledge, practical skills and competency to become a Domestic Installer. If you are new to the industry, then we would suggest our Domestic Electrician Package, which is the same as our Domestic Electrician Course for the first 15 days, then goes on to include our unique Experience Course. This course will give you additional practical and real life skills that will help better prepare you for your new career in electrics and the practical skills required. After either of these courses, you will be able to go on to apply to join a Government Approved Part P Scheme Provider (NICEIC/ELECSA) and self-certify that your electrical work meets current Building Regulations.